Glamour: Who is the most challenging character to design for? McCall: Probably Mary in this [season]. There are so many constraints on her wardrobe due to class and mourning [the death of her husband Matthew]. This whole series she’s in burgundy tones, purples and mauves and black, monochrome and grey. The whole wardrobe had to be in those tones because we couldn’t lift her out of mourning. As a result the vast majority of Michelle’s wardrobe had to be custom made. Even her country clothing had to be heathery tones, tweed. So that was quite tricky. Whether you miss the sarcastic (and often cruel) Mary of earlier seasons, love the outspoken Mary of recent episodes, or both, you probably admire McCall’s award-winning work. The costumes of Downton Abbey have a timeless beauty — and we can help you recreate that beauty in your jewelry! Mary’s necklace in this scene is probably close to 42″, but the beauty of making your own jewelry is that it’s custom-fitted to whatever length you prefer! Once you’ve measured out the beading wire to the length that feels best, you can begin stringing your beads. This may take a while, especially if you choose the 6mm beads and a long necklace, so you may want to multitask (perhaps by catching up on Downton Abbey). Once you’ve strung all your beads, simply follow the “finishing with crimps” instructions here for completing the necklace — and be sure to share pictures on the #BeadazzledCreations hashtag! For a bigger challenge, you can make a knotted version of this necklace. Just remember to pre-stretch your silk cord before using it! You can do this by unwinding all the silk from its card and dampening it lightly with your wetted thumb and forefinger. Loosely tie each end of the cord to a heavy object such as a shoe or a pair of scissors — then drape it over a doorway or shower rod and allow to slowly stretch overnight. Finish the necklace by following the “tying off with bead tips” instructions here. 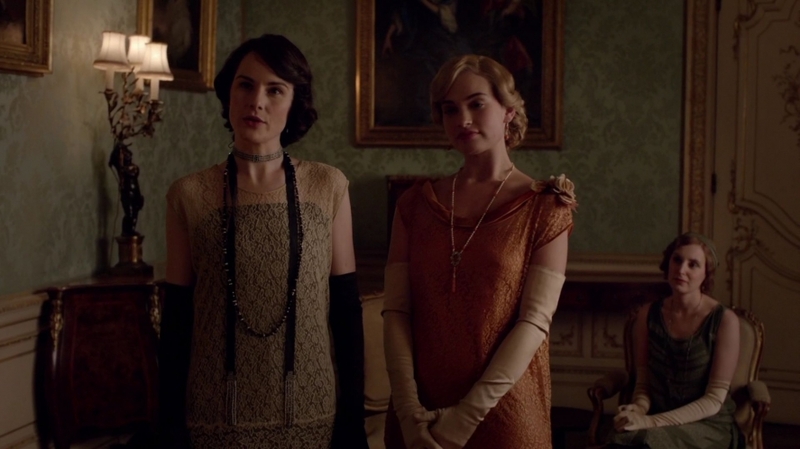 Michelle Dockery as Mary Crawley and Lily James as Rose Aldridge in Season 5, Episode 1. At first glance this season five piece might look similar to the one from season one above. Both are long, black, evening wear necklaces. But this second necklace is actually much more complex than the first, both in terms of the craftsmanship involved in its creation and the character development it indicates. Instead of a simple single-strand necklace, here Mary wears a multi-strand woven lariat. This is a very long, open-ended necklace wrapped loosely like a scarf. Mary has it layered with a ribbon choker for an added elegant affect. Including the neckline of her dress, this part of Mary’s outfit has five dominant lines — all curved and all complimentary, but still far more complex than the simple necklace from season one. The color blocking on her dress adds to this affect, and all together McCall has created the impression of a woman who carries complexity with self-assured ease. If you are comfortable with seed bead weaving, you can recreate this impression for yourself. As an accessory of an aristocratic woman in 1920s England, Mary’s necklace is probably made of jet. But you can use glass seed beads in black opaque matte. If you’re not familiar with seed bead weaving, check out some of our classes or how-to books. 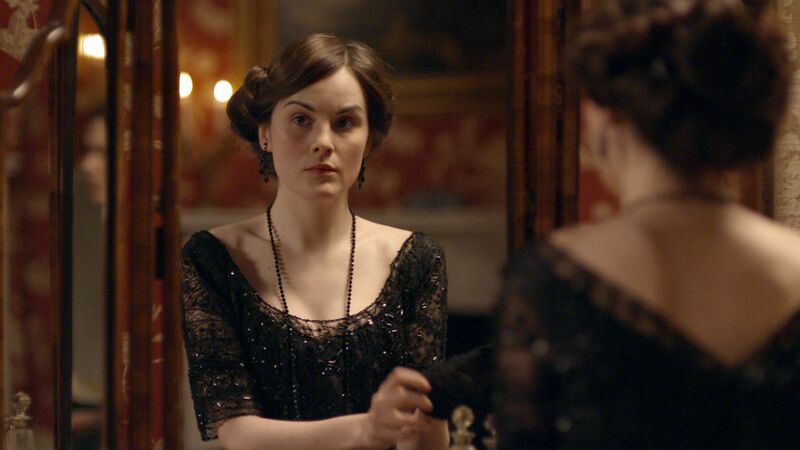 Season five of Downton Abbey hits U.S. screens early in the new year, so hurry up and create your Lady Mary look now! Our “What We’re Watching / What We’re Wearing” series draws from all media to feature distinctive jewelry anyone can make themselves. If you would like to see us feature any particular character or public figure, comment below with suggestions! Images from this post were drawn from Screencaps Heaven and Kiss Them Goodbye, with the exception of the featured image from tumblr.